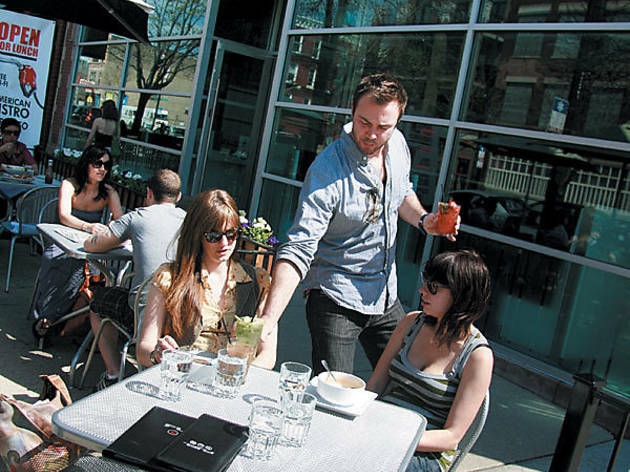 Hit Wicker Park's newest outdoor spots in this food-and-drink crawl. To properly begin a night in the new Wicker Park, you must pay homage to the old. And there’s no better place to do that than here, a bar that is a testament to the ’hood’s legacy of beer-and-shot joints. There’s not much outwardly special about this place—no fancy microbrews, no fancy cocktail list, no fancy anything. But the lush garden in back? Fancy that. 1745 W North Ave (773-252-6053). You’ve got a shot or two in your belly already; time to start padding that thing. Provided you get here in time (the place closes at 8pm during the week, 5pm on weekends), this BYOB sandwich shop has plenty of spongelike options. The smoked salmon with pumpernickel, goat cheese and pickled onion (pictured) should work. But maybe sip water this round—there’s plenty of drinking ahead of you. 2211 W North Ave (773-276-2100). This is the reason you waited to drink: The thin, blistered pies here, topped with silky prosciutto and creamy mozzarella, warrant a full glass of Italian white with each slice. Stick to the formula of wine and pizza, though—the rest of the menu fails to impress, which would put a damper on your night (not to mention the experience of eating on this piazzalike patio). 1266 N Milwaukee Ave (773-687-8895). All right, kiss those tame restaurants goodbye: Your next stop is this bar/eatery/coffee shop, which wants you to have a loud, caffeinated experience among hordes of other jacked-up imbibers. Those crowds can fit on the patio because Division is a double-wide sidewalk, but if you stay for a round of Southern fried-chicken sliders, you’ll be double-wide, too. So finish that espresso-spiked Fuel martini and jet. 1725 W Division St (773-782-6034). Last stop: a drink in peace to calm the nerves before sleeping. 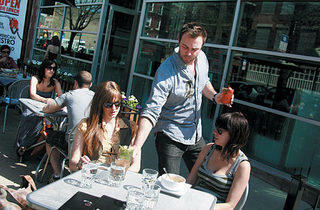 At this sidewalk patio, the seating stretches out not only on busy Division Street but also the calmer Paulina Street. Choose Paulina. You need to wind down. (But don’t worry—plenty of vodka lemonade will keep you from falling asleep on your table.) 1700 W Division St (773-227-3100).